The system is based on a Mean Reversion pattern on Monday. The backtest has been conducted from 2006. The trades are opened every Monday at the appointed time. The EA calculates position volume based on the market situation. The trading robot can use up to 4 averaging. The EA does not use StopLoss. Timeframe – M15. Currency pair: USD/CHF. The EA can be backtested by bars or every tick. StartLots – starting lot size. This is an initial basing lot to open a trade. It can be modified by EA basing on a market situation, but no more than twice. StartHour, StartMinute – operation start time. StartMinute must be a multiple of 15 (0-15-30-45). The recommended time 02:45 for EET (Eastern European Time). TakeProfit – profit target as % of the current price. StepPip – step of averaging in pips. UseMM_Balance – value in deposit currency. If this option is set (i.e. different from 0), then the starting lot is calculated per each part of UseMM_Balance of deposit. If set to 0, then the starting lot is fixed and equals StartLots. For example, if StartLots=0.1 and UseMM_Balance=300, when the deposit is 300, the EA will open an order of 0.1 lot, and when the deposit is 600 – 0.2 lot, when the deposit is 900 – 0.3 lot, etc. This parameter is needed for reinvestment. Minimum leverage - 1:100, higher value is recommended. Recommended types of accounts – NDD and ECN. The EA does not require optimization. The whole trading system is quite funny but i have to admit it is amongst the most profitable EAs on the market. It does what is explained in the Overview and only trades once a week. After two months of use it was 6/6 times in the profit. Phenomenal! It definitely won't make you rich but it has a very straight forward mechanism and does the job. Have use this EA Since Sept'15, entries were mostly sharp which TP in a single open position but always refrain using the EA 3 days before any high impact news as USDCHF tend to trend and little rollback. Excelente robot, me gusta cómo va, vale la pena sólo por USDCHF. I like the idea and it's worth to try just for USDCHF! - Implemented a new filter - 'MomentumFilter%ATR'. The value in percentage of ATR. If set to 0 then disabled. If the day before signal(on Friday) there was a strong price movements more than specified %ATR (a strong momentum or external factors, news), it is possible that momentum will continue on Monday in the same direction and the signal will be skipped. This filter fixes drawdown in the aggressive mode. - Introduced a new parameter - 'StartLots%Depo'. Start lot value in %. When not zero, the start lot is calculated as % from deposit, StartLots and UseMM_Balance parameters are ignored. If zero, then the EA will work with StartLots and UseMM_Balance. - Introduced a new parameter - 'SpreadFilterPip'. The spread filter in pips. If spread &gt; this value, then the signal will be ignored. - Introduced a new parameter - 'Direction'. Select direction of position opening: 0 - buy and sell, 1 - buy only, 2 - sell only. - Introduced a new parameter - 'ID'. Unique identifier for the EA. Used for the best control of orders when running multiple EAs (such as Digger, Miracle) of my design with the same MagicNumber. 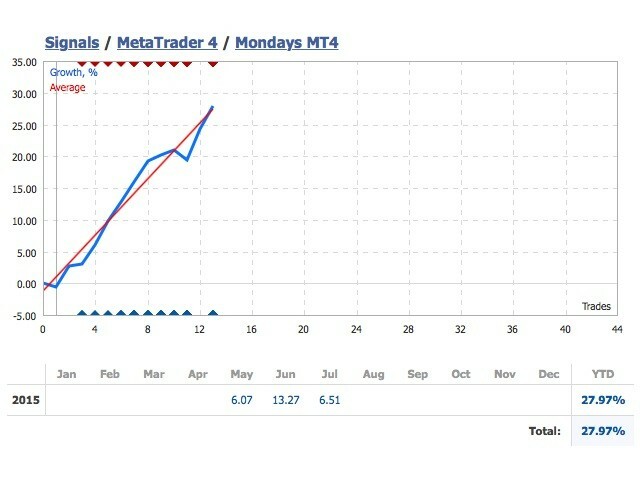 - Introduced a new parameter - 'StartDayOfWeek' – trading day of the week (0-Sunday,1,2,3,4,5,6) when the EA will trade. - Introduced a new parameter - 'MarketSituation'. If set to false, the EA does not adjust StartLots based on the market situation and StartLots is fixed. 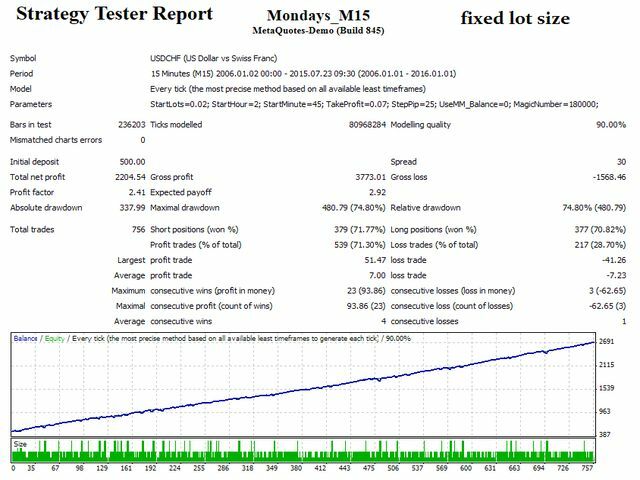 - TakeProfitPip - take profit set in pips now. - The number of averagings reduced to 3. - Introduced ConservativeMode. If set to true, the EA will not use averaging and martingale\grid elements. The MondaysEA will trade only favorable situations and will control risk by using stop loss(StopLossPip) and timestop(StopBar). - Introduced a new parameter - 'StopLossPip'. For ConservativeMode=true only. Stop loss in pips from the entry price. - Introduced a new parameter - 'StopBar'. For ConservativeMode=true only. 'StopBar' - number of bars after which the position will be force closed if trade does not complete in TakeProfit or StopLoss.